Church leaders in the Central African Republic have reiterated their opposition to the ongoing violence in the country and demanded more troops on the ground. A declaration was signed by four prominent Church leaders, after a gathering of 170 Protestant and Catholic leaders on Feb. 4 in Bangui, noting that the violence has continued despite the recent regime change. The signatories included Rev. Nicolas Guérékoyamé-Gbangou, President of the Evangelical Alliance, and Catholic Archbishop Dieudonné Nzapalaigna, President of the Episcopal Conference. 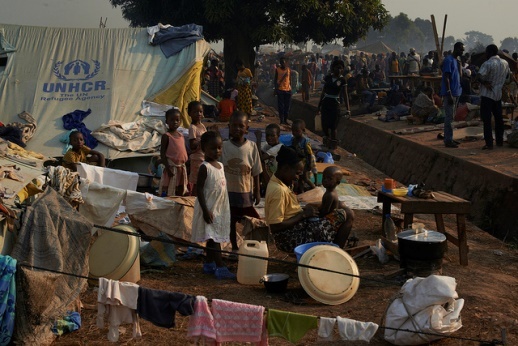 The Central African Republic has been beset by violence since December 2012, when a coalition of rebel groups, led by Michel Djotodia under the Séléka banner, moved through the country to eventually drive out President Francois Bozizé in March 2013. Djotodia took control of a transitional government, but resigned from his post last month as he failed to restore peace. On January 22, the National Assembly elected Ms Catherine Samba-Panza president, making her the first female president of the CAR. As Séléka influence waned and the rebels retreated to the north, and notably to neighbouring Chad and Sudan, local Muslims perceived as accomplices of Séléka have faced attacks by self-defence militias known as Anti-Balaka (‘Anti-Machete’). “The confrontation between Séléka and Anti-Balaka has started a cycle of reprisals in which the civilian population has fallen victim. 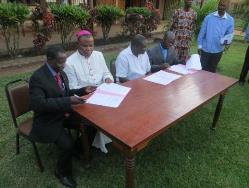 We condemn this violence, whatever its origin,” wrote the church leaders. More than 1 million people have been displaced and nearly 2 million require urgent humanitarian assistance, according to aid organisations. On Feb. 12, the UN World Food Programme began to airlift food from Cameroon, as the CAR faces a deepening hunger crisis, while its roads are too insecure to be used to transport enough food to support the many in need. The operation will last four weeks and is aimed at supplying 1,800 tons of cereals, sufficient to feed 150,000 people for one month. CAR’s church leaders reiterated their position that the Anti-Balaka is not a Christian movement and that this crisis is at its core political, and not religious. Catholic and Protestant leaders also urged national and international media to stop referring to the Anti-Balaka as a Christian militia. In their declaration, the Church leaders noted that although the temptation for revenge is great, Christians should retain their principles in their political, economic and social engagements. “We need to engage in a battle for human dignity and social cohesion. We need to commit ourselves to the struggle for national unity. We need to enter into an endeavour for brotherhood among the Central African peoples. We need to enter into a process of forgiveness that leads to reconciliation and healing… However that does not prevent the application of justice,” the statement reads. Church leaders have engaged in various activities to attempt to quell interreligious tension, in collaboration with the President of the Islamic Community in CAR, Imam Kobin Layama. The leaders called for the full implementation of the resolution to deploy at least 4,500 forces from the African-led International Support Mission to the Central African Republic (MISCA), and urged the UN to send a further 10,000 troops. This is the second declaration by Church leaders since the conflict began, following a declaration in October last year.